Because of the lack of participation and some other issues, we are cancelling the remainder of our Doubles league for this year. Thank you to all who participated. Here are the results of our October 6th Tournament. Sam Taylor had the shot of the day when he missed this putt for birdie on hole #10 by having his disc hang on the outside of the basket. 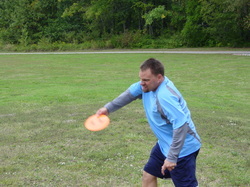 Steve Boylan Ties Course Record on Last Monday Night League for 2012! Steve Boylan tied the Mt. Gilead Course Record previously set by Greg Hastings at 48. We had 10 ________(brave, crazy, brain-dead, soaked) you fill in the blank, disc golfers who braved the very wet weather to compete in the last Monday Night League of 2012. It rained the entire round of 18 and of course, stopped as soon as we finished playing! It was a little rough finding traction for the feet and grip for the hands, but didn't seem to faze Steve as he shot a blistering 48 to tie the course record. Nice job Steve and all those who stuck it out and braved the rough weather. Thanks to all who participated this year and helped make the expansion to 18 holes possible. We hope to make the course even better for next year! Saturday, September 22 Mt. Gilead hosted our First Beans-N-Burgers Blowout Tournament. We had over 35 participants play 27 holes in an Ace Race format. We had 2 divisions, Advanced and Novice. Prizes were awarded to the top 3 in each division. Here are the results. 2012 Ace Race a Success! Matt posses with his stash from winning the Ace Race. He and Dave ended with a tie, with Matt winning on the playoff hole. Congratulations Matt! Dave Nolting places Second in the Ace Race & wins a Ring of Fire. Dave and Matt tied for first in the Ace Race, with Matt edging out the victory on the playoff. Dave came back strong to win the Ring of Fire contest shortly after. Jerry Stevens comes from behind to place Third. The surprise of the day had to be Jerry Stevens coming from nowhere to place third. Jerry was in 15th place after the first round, but came back with 20 points in the second round and did it with only 1 Ace and 18 metals! There was a 3-way tie for third, but Jerry stayed hot on the playoff hole to take the final spot. Nate Martin was our other Ring of Fire winner. Congratulations to Nate and all of our other winners for the day. Everyone scored and had a great time in our first Ace Race. Looking forward to next year being even bigger and better. Greg Hastings Aces Hole #2! Greg Hastings got his first Mt. Gilead Ace on hole #2 on Sunday, September 16, 2012. Greg has come close on a few holes, but finally made it in the basket....and even had several witnesses, including myself. Congratulations Greg! Greg Marine Aces Hole #3! Tonight at league (8/20/12), Greg Marine Aced hole #3! Greg's foursome started on hole 3 so unfortunatley, it's all downhill after you ace the first hole! To my knowledge, this is the first time this hole has been aced. Great job Greg! 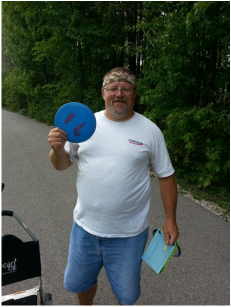 Well, Rob did it again folks, he aced hole #2 again at league tonight with a Drone (7/30/12). Congrats Rob, of course he had to get that ace in order to beat me by 1 stroke! 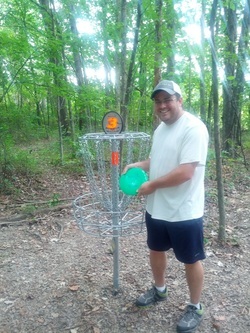 Sean Denbo stands proud as he records the second known ace on hole #2 on 7/14/12. Congratulations Sean! 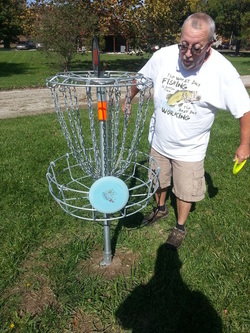 Rob Henderson recorded the first Ace at the Mt. Gilead Course on 10/16/11 on hole #2. CONGRATULATIONS ROB! He also aced the old hole #9. We added 3 portable baskets to the course tonight for a total of 2 rounds of 12 holes. Par for tonight is 72. WE WILL SEE YOU ALL BACK IN 2013 FOR OUR MONDAY NIGHT HANDICAP SINGLES LEAGUE!